Integral Investing is our investment philosophy and practice based on Ken Wilber’s Integral Theory. Integral Theory is applied in more than 50 disciplines across the world including economics, business, education, and medicine. One of its key concepts is the AQAL framework. AQAL means All Quadrants All Levels and stands for Plato's indivisible humanity values spheres, the True, the Good, and the Beautiful. Since the mid 1990s, Integral Investing has enabled our investment activities to reach a high degree of integral sustainability and to address “the need of the present without compromising the ability of future generations to meet their own needs” (Brundtland World Commission on Environment and Development, 1987/2009). Through Integral Investing, financial returns are inseparable from a high impact on Environmental and Social responsibility, ethical corporate Governance (ESG), as well as cultural aspects and happiness factors. Traditional Investing is profit-only oriented and thus challenges investors to earn superior financial returns consistently. Impact Investing, however, has shown over the past three decades that an increasing number of investors want to integrate their values within their investment decisions by seeking investment opportunities that make a profit in addition to having a social and/or an environmental impact. Integral Investing is the vehicle through which we provide a sustainable integration between traditional investing and Impact Investing, because we believe that financial sustainability is just as important as environmental and social impact. Until we reach the tipping point where traditional investing includes people and planet metrics in addition to profits as measurement criteria for success, we are focusing our investment efforts on developed countries. In our investments we integrate rigorous financial and legal due diligence criteria (Profit) with social (People), environmental (Planet), cultural, behavioral measurements as well as high ethics, morals, and higher human values (Passion and Purpose). However, we can only achieve what we measure and therefore, are using various standards to assess our progress. For example, we observe the Sustainable Development Goals of the United Nations (UN SDG), the Principles for Responsible Investing of the United Nations (UN PRI/ESG), as well as B Corp GIIRS, GIIN IRIS and IIRC, to name a few. ...ensures that People, Planet, Profit, Passion and Purpose receive equal attention and one is not preferred over the other. ...includes the social and governance criteria as defined by the UN PRI and adds culture, happiness, and higher consciousness aspects. It includes exterior factors such as behavior and social attitudes, as well as interior dimensions such as emotions, values, needs, and other consciousness aspects. ...refers to the environmental criteria as defined by UN PRI and adds aspects of Integral Ecology. ...addresses rigorous financial measurements to ensure financial and economic sustainability. ...makes sure that the individual and collective interior aspects of the participating agents in the investing process are also taken into consideration. ...refers to investments within the context of exponential growth, exponential tech, climate change, and geo-political challenges. At the center of Integral Investing is Ken Wilber’s Integral framework that informs all our decisions along the value chain creation. It enables us to achieve the sustainable integration between traditional, profit-oriented, investing criteria and impact investing measurements alongside social, environmental, and governance metrics. It begins with deal screening and continues with the due diligence process, the investment execution, and investment monitoring up to the investment exit and wealth realization. The Theta Model is a proprietary de-risking and impact measurement framework born through the application of Integral Theory in investing. It integrates financial and legal due diligence metrics with Environmental, Social, and Governance and UN SDG criteria, alongside cultural, behavioral, and consciousness measurements. The Theta Model targets both superior financial market returns and premium impact returns for the benefit of all stakeholders. In Step 1 the Theta Model addresses traditional financial and legal due diligence components that try to identify the unknown by validating the business plan, uncovering missing pieces, defining the financial and legal risk, as well as other risks associated with the market, competition, and intellectual property (IP). 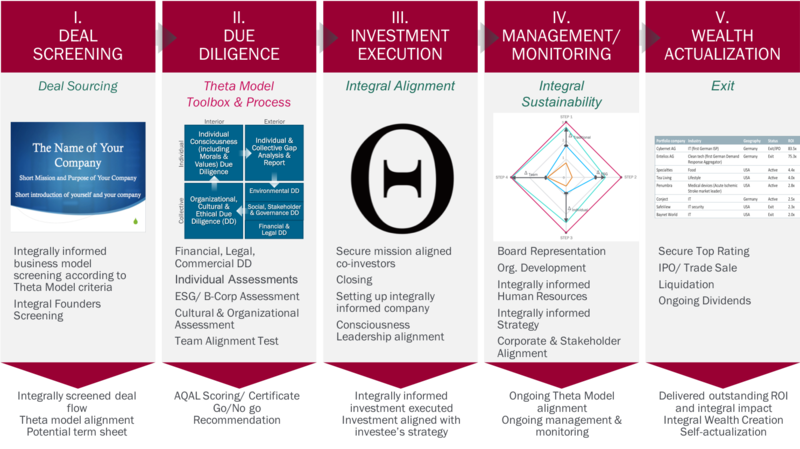 In Step 2, the Theta Model performs due diligence on Environmental, Social, and Governance criteria. The adoption of Environmental, Social, and Governance (ESG) metrics of the United Nations (UN PRI, 2013) helps (1) reduce risk, (2) create sustainable and responsible companies from the very beginning, (3) produce more transparency (IIRC, 2013), and generate compliance with the International Stock Exchange Initiative to receive a good rating in case an initial public offering (IPO) will occur. There are several tools that can be applied to accomplish the goals in Step 2. The GIIRS-based (Global Impact Investing Rating System) self-assessment offered by B Corp (2015) is highly recommended. Beginning with Step 3, the Theta Model goes well beyond traditional investing, sustainable and responsible investing, or impact investing criteria. It includes additional aspects of reality—such as interior, evolutionary, behavioral, inter-objective, and inter-subjective. There are various tools that can be applied here. We have had very good results with Susanne Cook-Greuter’s SCT Sentence Completion Test but also with LDMA (Leadership/Lectical Decision Making Assessement), a tool based on work performed at Harvard University Graduate School of Education; initiated by Prof. Kurt W. Fisher and later enhanced by Stein & Dawson & Fischer. Any experienced investor will agree that investing in a high-quality management is the litmus test not only for the success of the start-up, but more importantly for the success of the partnership between investor, entrepreneurs, community, suppliers, and other stakeholders. In our experience, more than 80 percent of the investment risk can be addressed by performing an integral due diligence on the team. Here too, there are a myriad of tools that can be applied to team assessment. The Five Dysfunctions of a Teamis such a tool based on the book with the same title by Patrick Lencioni. Step five is the summary of the integral due diligence process contained in the Theta Model. It offers a gap analysis and report und makes the final recommendation for the investment based on the Theta Factor, which is a number that results from the summary of each due diligence step. A positive investment decision will be made only if more than 80 percent of all requirements have been fulfilled in order of importance. "Der Worte sind genug gewechselt, lasst mich auch endlich Taten sehen! Indes ihr Komplimente drechselt, kann etwas Nützliches geschehn." Want to know more about our secret sauce on investing?